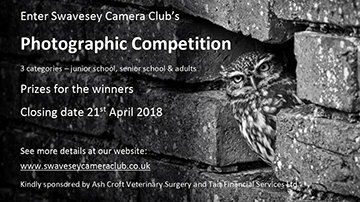 The images should be emailed as a JPEG file, be less than 5mb, with the title, their name, their school or group (if applicable) and their own email address to scc.competitions@googlemail.com with the subject heading of Open Competition Entry before 21st April 2018. No more than four images per entrant. There is an Adult prize of 1 year's membership to SCC (worth £63) and cash prizes of £25 to the two junior winners. The winning entries and others will be displayed at the Annual Exhibition on 28th April 2018 in Swavesey Memorial Hall.